The main task of the Fund is the financing and crediting of joint practical actions and perspective programs and projects for the Aral sea saving, ecological rehabilitation of Pryaralye and of the Aral Sea Basin as а whole with account of the interests of all the states of the region. The founders of the Fund are the Republic of Kazakhstan, Kyrgyz Republic, the Republic of Tajikistan, Turkmenistan and the Republic of Uzbekistan. The permanently acting executive body of the Fund is the Executive Committee. Executive Administration of the International Fund for Saving the Aral Sea in the Republic of Kazakhstan (IFAS EA) is an international organization aimed at solving problems in the Kazakh part of the Aral Sea basin and Prearalie and striving for positive changes in life of communities in Prearalie by improving economic and social conditions. IFAS EA facilitates implementation of projects on water, environment, and socio-economic development. In its efforts, it relies on experience of its staff and wide range of partners. According to the Regulations on IFAS EA in the Republic of Kazakhstan, its main tasks are ensuring practical implementation of decisions made by the Council of Central Asian states heads, IFAS President, Executive Board, and Executive Committee related to the Kazakh part of the Aral Sea basin, implementing and monitoring projects and programs funded by republic and donor-countries, raising funds of donor-countries and international organizations to finance programs and projects on the rehabilitation of the Aral Sea basin, and preparing information materials for authorities of the republic and members of IFAS Executive Board from Kazakhstan and IFAS Executive Committee. Agency of the International Fund for Saving the Aral Sea for implementation of the Aral Sea Basin and GEF projects (GEF Agency of IFAS) is a working body of the International Fund for Saving the Aral Sea. The Agency is entrusted with practical management and implementation of projects on problems in the Aral Sea basin, coordination and attraction of funds, control and establishment of contracts, organization of procurements, and recruitment of companies, firms, individuals, and legal entities to implement projects, their components, sub-components, and specific activities for the benefit of all Central Asian countries in full compliance with the Regulations on IFAS Executive Committee. Increased collaboration with international organizations, donor countries and other funds. ICWC is a regional body of the Central Asian states to deal with joint solution of issues related to shared water management, effective use and protection in the Aral Sea basin and to implement of commonly elaborated programs following the principles of collectivity and mutual respect of parties’ interests. SIC ICWC is an information and analytical body, which develops methods and approaches of prospective development, improvement of water management and ecological situation in the basin. SIC ICWC is collaborating with a network of scientific and design organizations of the five countries of Central Asia, has national branches in three countries which, in turn, organize scientific and information exchange at the national level. Basin Water Organization “Amudarya” is an executive and interdepartmental control body of Interstate Commission for Water Coordination of Central Asia. BWO “Amudarya” provides water resources within ICWC established limits in the Amudarya river basin. It operates water-intakes, hydropowers, reservoirs of common use, interstate canals under strict observance to nature protection requirements and implementing measures on ecological situation improvement. Basin Water Organization “Syrdarya” is an executive and interdepartmental control body of Interstate Commission for Water Coordination of Central Asia. BWO “Syrdarya” provides water resources within ICWC established limits in the Syrdarya river basin. It operates water-intakes, hydropowers, reservoirs of common use, interstate canals under strict observance to nature protection requirements and implementing measures on ecological situation improvement. Proceeding from the 21st ICWC meeting, a Training center for capacity building in the Central Asian water sector was established at SIC ICWC. Along with raising the level of professional knowledge, the training contributes to cooperation among the riparian countries in the field of water use and management and elaboration of common approaches at the level of water specialists and decision makers. The prime objective of the Interstate Commission for Sustainable Development (ICSD) is coordinating and organizing regional cooperation in the area of environmental protection and sustainable development in Central Asia. Organization and coordination of activity for elaboration of regional sustainable development strategy, programs, and plans. Management of regional environmental and sustainable development programs, action plans, and projects. Preparation and expertise of regional projects. Coordination of actions related to fulfillment by the Central Asian countries of environmental conventions of transboundary nature. Contributing to harmonization of environmental legal and procedural frameworks. Promotion of interstate exchange of information and development of regional environmental and sustainable development information bank. develop basic environmental principles, indicators, and criteria for adoption by the Central Asian states and their incorporation into relevant legislative acts. One focus area of the Tajik branch of SIC ICSD is the generation of environmental and sustainable development data support system. fulfill assignments of the ICSD Chairman. Goal of the RMCCA is to promote cooperation of the CA states on conservation of the mountain ecosystems, sustainable use of their natural resources and improving social and economic conditions of the population living in mountain regions including provision of scientific and informational support and training for specialists. The Central Asian Regional Center on Renewable Energy Sources is aimed at facilitating coordinated actions on implementation of the environmentally friendly energy sources in economic and other sectors in Central Asia by joining scientific and technical capacity and experience of the countries. Commission of the Republic of Kazakhstan and the Kyrgyz Republic on the Use of Water Management Facilities of Intergovernmental Status on the Rivers Chu and Talas. The Global Water Partnership (GWP) was established in 1996 in response to the call during the 1992 UN Conference on Environment and Development (UNCED) in Rio de Janeiro to manage water resources sustainably, in accordance with the Dublin principles, to resolve current and future water crises. The GWP does this through promoting a holistic, participatory and cross-sectoral approach to water management known as integrated water resources management. The mission of the Global Water Partnership Caucasus and Central Asia (GWP CACENA) is to support CACENA countries in the sustainable management of their water resources. Regional Environmental Centre for Central Asia (CAREC) Mission is promote multi-sector cooperation in addressing environmental problems in Central Asia at the local, national and regional levels. The goal of the United Nations Regional Centre for Preventive Diplomacy for Central Asia is to assist and support the governments of Kazakhstan, Kyrgyzstan, Tajikistan, Turkmenistan and Uzbekistan in building their conflict prevention capacities through enhanced dialogue, confidence building measures and establishing genuine partnership in order to respond to existing threats and emerging challenges in the Central Asian region. The International Water Assessment Center (IWAC) is the subsidiary joint body of the Convention on the Protection and Use of Transboundary Watercourses and International Lakes (hereinafter referred to as the Convention). assist to the Parties to the Convention in the preparation of reports on the status of transboundary waters, including on the basis of general regional information, as well as in the development and maintenance of relevant databases. 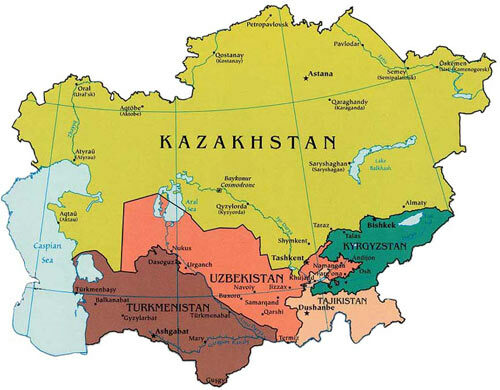 IWAC will have a special focus on Kazakhstan’s neighboring countries, other Central Asian countries, as well as other countries inside and outside the UNECE region, as appropriate. UNDP works in more than 170 countries and territories, helping to achieve the eradication of poverty, and the reduction of inequalities and exclusion. UNDP helps countries to develop policies, leadership skills, partnering abilities, institutional capabilities and build resilience in order to sustain development results. UNDP’s mandate has four pillars: poverty reduction and the mdgs; democratic governance; crisisprevention and recovery; and environment and sustainable development. This section is dedicated to international non-governmental organizations with a view to wider involvement of Russian-speaking audience in their activities. Web site of preparation process of Central Asia and its paricipation in the World Water Fora. Section includes water related highlights of year. The database “Water Atlas” contains information on the water-management and environmental organizations. The database “Who is Who in Water Management” contains information about people working in water management.